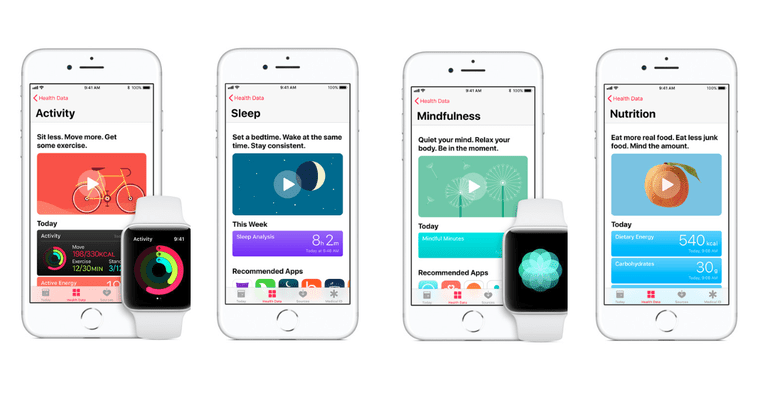 Apple's Health app offers a variety of health management tools. The iPhone Health app (available for iPod Touch, too) comes pre-installed on your device. Health helps you record and manage your health and fitness information in one place. You'll find the Health app is already on your iPhone; you don't have to download it when you purchase a new one. If you have an iPhone 4s or anything more recent than that model, you'll be able to use the Health app. It'll also work on a fifth-generation (or later) iPod touch. The app's logo is a pink heart on a white background. It tracks basic activities such as steps, flights climbed and walking and running distance. So if you're out for a long walk and you aren't wearing a fitness tracker, you can still get a sense of how much activity you've completed. It helps you manage multiple health issues. If you have an Apple Watch, it will also pull in all stats that are tracked by your wearable. It lets you create a Medical ID, which is basically essential info about you that could come in handy in a medical emergency. Input your medical allergies, conditions and allergies, and specify that you want this information to be visible in an emergency even if you phone is locked. It's worth pointing out that the Health app discussed here is not the same as Apple's Activity app. You may hear both of these apps mentioned in conversations about fitness-tracking with Apple products, but the two are not interchangeable. The Health app is what you'll find on iPhones and the iPod touch, while the Activity app is unique to the Apple Watch. Here's a look at the four sections of the Health app. Note that each section includes recommendations for relevant third-party apps that integrate with Health, so if you want to get into calorie counting or other nutrition-focused areas but don't know where to start, you'll have some guidance. The Activity section of the Health app aggregates all activity info from your various sources. Your iPhone or iPod touch is one source, while fitness apps and the Apple Watch are potential additional sources. If you're interested in tracking your workout stats, this is the part of the app that will be of the most interest to you. You can view your activity data (including steps, flights climbed and more) by the day, by the week, by the month or by the year. So if you're interested in discovering any patterns in your workout behavior, you'll definitely be able to do so with this app. If you have an Apple Watch, you'll see your progress toward daily goals (like 30 minutes of exercise and standing up once per hour) displayed in the Activity section as well. Next up is the Mindfulness section, which keeps track of how much time you spend using relaxation- and meditation-focused apps. This might not be as relevant to you as the activity-tracking section explored above, but if one of your goals is to decrease your stress levels, it could be handy to have this tool for keeping track of your daily progress. This section could very well go hand in hand with the Activity portion of the Health app, especially if you're trying to lose weight. As with Mindfulness, if you don't already have any relevant apps installed on your compatible Apple device, this area will be completely empty. However, once you download and start using apps like Calorie Counter & Diet Tracker, Lifesum and Lose It!, the Nutrition section will display calories eaten along with your intake of a wide variety of nutrients, from biotin to iron. It's worth noting that while the Health app can clearly display a wide variety of fitness and nutrition data, don't expect it all to be automated. While the app will automatically track the basic metrics, you'll have to manually log your meals — we're unfortunately not yet living in a world where our gadgets are "smart" enough to automatically recognize what we're eating and how many calories it contains. The final section of the Health app app is focused on how much rest you get. If tracking the quantity and quality of your ZZZs is a top priority, you'll likely want to invest in a fitness tracker with sleep-tracking functionality. Many of the recommended apps found in this section are tailor-made for sleep-tracking gadgets, but you can also manually enter in your estimated sleep time and view trends over time. As mentioned above, many features bundled in Health require using third-party apps or even wearing an activity tracker. If you're just getting started, you'll notice that the Activity section is really the only one to track data on its own; this is because your iPhone or iPod touch can track basic activity stats within needing an outside source. Neither gadget can gauge your sleep time or daily caloric intake on its own, however. When you're in the Health app, tapping on the "Today" tab (second from the left at the bottom) will bring up a summary of all recorded stats for that specific date. If you haven't logged any nutritional info for a specific day but you have logged exercise, the app will simply not show any sleep metrics here. You can swipe left or right to view data from previous or later dates. If you already have plenty of great sleep-tracking, mindfulness and nutrition apps, you can make sure they're being pulled into Health (if possible) by tapping on a specific metric (such as "Steps" under the Activity section) and then tapping "Data Sources & Access." Then you'll see which apps on your device can be integrated with health, and you can tap "Edit" at the top-right corner if you want to remove any sources (such as an Apple Watch you don't plan on using anymore). The Health app on the iPhone and iPod touch is a pretty powerful tool, as it will tell you exactly how many steps you've walked on any given day without requiring you to wear a fitness band. If you use any compatible apps or wear an Apple Watch or another activity tracker, Health gets even better — as it can pull in even more info to provide a fuller picture of your wellness. This probably isn't the only fitness-related app worth having on your iPhone or iPod, but it's definitely not to be overlooked. Make sure to fill out your Medical ID and spend some time exploring the recommended apps to make sure you're getting as much out of this tool as possible.